Nigerian comic act Funke Akindele is pregnant. Isn't that some beautiful news? The Jenifa's Diary star was spotted with a bulging tummy on Sunday. 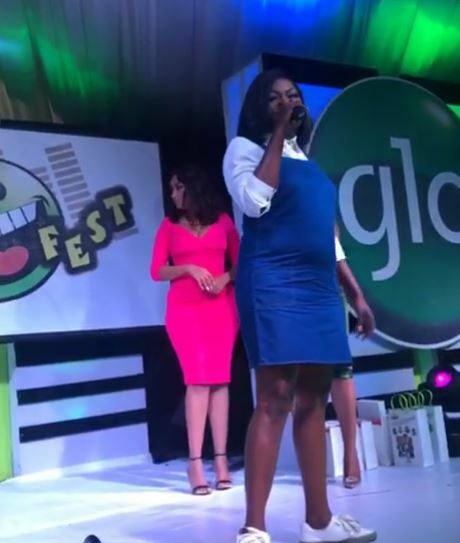 Photos taken at Glo Lafta Fest, held in Festac Lagos, shows the Nigerian filmmaker rocking a blue pinafore dress with a visible baby bump. Recall that in December 2016, a Nigerian pastor, Olagorioye Faleyimu, had prophesied that Funke would not have a child of her own and that she may end up with another broken marriage. He advised her to marry a pastor who would help her fight her battles (perhaps he meant she should marry him). A popular actress in Nollywood, Funke Akindele, who was once in the Yoruba movie industry should pray deeply so as to have children.Another grace she has is to marry a pastor who can fight the battle on her behalf with prayers.